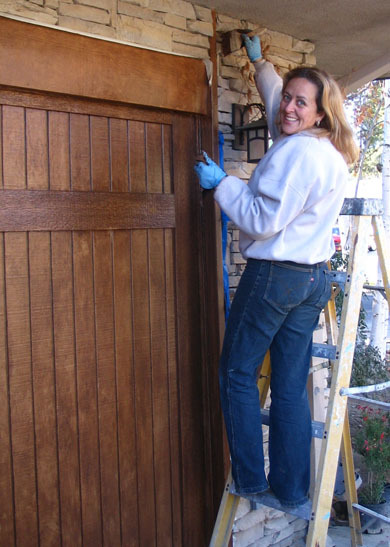 How To Make a “Carriage Garage Door” Look-Alike! When I renovated my landscape and gardens, I also treated the exterior of my house to a makeover. The garage door was especially unattractive and lacked architectural character. What I really wanted was an authentic wood carriage door to compliment my "stacked stone farmhouse," but it was too expensive. I had to put on my "television garden makeover designer" hat on, and create some magic for my own home! I started out with a plain, cheap-looking plywood panel garage door. To create the "carriage look" I would need to add detail, so I bought some vinyl siding strips at Home Depot and went to work! A carriage door catalog was my inspiration. I selected one of the simple designs and adapted it to my small budget, adding vinyl siding to separate the door into "panels." Soon, the "carriage door look-alike" started to emerge but I wasn't happy with the paint finish on the plywood and vinyl which gave away its humble composition. I needed a talented artist to create a faux wood finish for my garage! Juliana Zanon to the rescue! An accomplished fine artist and professional decorative painter, Juliana Zanon is a fiery Brazilian beauty with a confident stride, big smile, and a wardrobe of paint splattered clothes. She also drives a motorcycle. Juliana and her artist-sister, Carla experimented with different color samples before settling on the perfect color for my carriage doors- "Whiggy Brown!" Don't discount your dog (if he's as beautiful as Whiggy) for your color inspiration! You won't find "Whiggy Brown" paint color at Dunn Edwards, by the way. 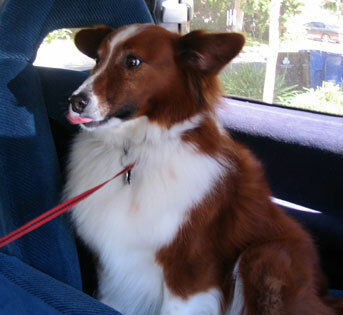 Whiggy is my dog, and he has the most beautiful reddish brown hair that glistens in the sun. By chance, Whiggy was sunbathing in the driveway the morning that Juliana and Carla caught site of him. The duo began to mix colors, taking turns walking up to Whiggy to compare colors until they had a perfect match! Carla puts the finishing brushes on her faux wood creation! The faux wood grain was created by combining a base color and two highlighting glazes. People have always commented on Whiggy's beautiful brown and white mane, but now, they comment on the color of my "Whiggy Brown" carriage door! Juliana and Carla did such a convincing job replicating the look of wood grain that people often mistake the plywood and vinyl combo as real wood. I don't let people know that my carriage garage doors are just faux painted plywood and vinyl. If someone asks me how much my carriage doors cost, I tell them it's "fake" and let them touch it. I love to see the look of amazement in their eyes! Now you know my designer secret too! 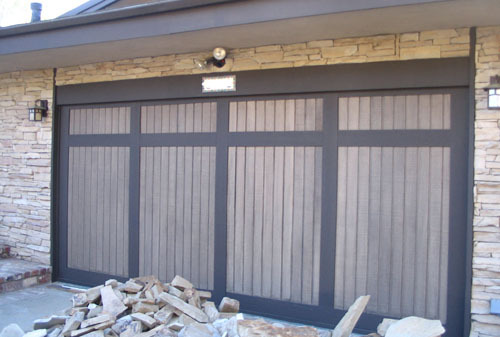 While I'm on the subject of garage doors, here is some great information on driveway gates to help you make the entrance to your yard more private! It was a good solution for us. Love this! For the first time, I wish I had a large solid door instead of panels. This looks fabulous! Love the color – looks so rich! Great stuff! Nice to meet you. Much cheaper than an actual carriage door. That door looks great – I have always wanted a really nice garage door, but have only had the cheap kind. It looks like a lot of work though. Love the final outcome – and the fact that you didn’t stop until you got the exact result that you wanted! Glad you like it Jen~ How sweet of you to comment. Hi Crystal-thanks for your visit and question. I invite you to visit Juliana Zanon’s website and leave her a message on her email. Juliana custom mixes all her paint using raw pigments and I’m not sure what color ratio’s she used for the “Whiggy Brown.” I remember watching her add a little of this and that until she had it just right. Sorry I can’t give you more direct instructions but this was a truly custom paint job- that’s why I needed an artist! You said that you used a base color and 2 glazes. What were the exact colors and paint? How did she apply them? Could I somehow do this with a mixture of gel stains? If yes…..how? Thanks so much! Hi Rick. The door is one piece. Thanks for your visit and for participating. Is this door 1 piece or a folding door? The door with the siding added to it. It looks great.